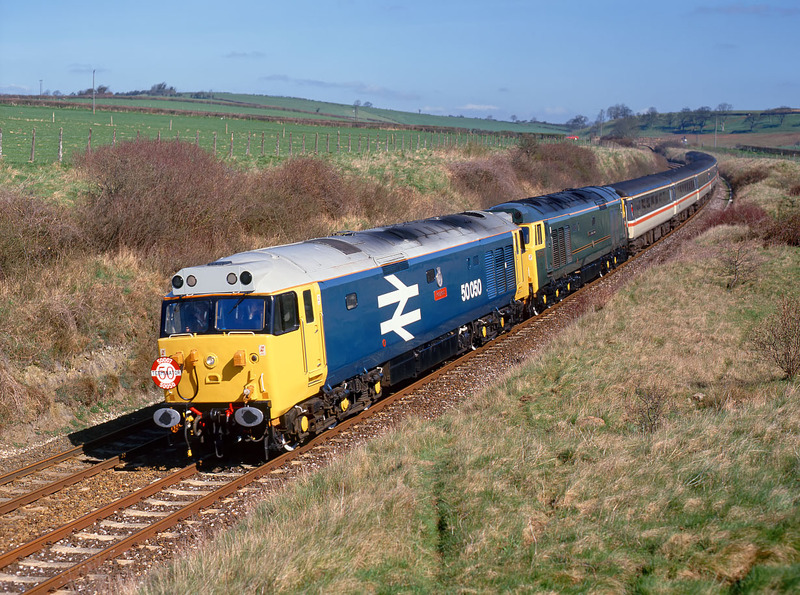 26 March 1994 was a sad day for Class 50 enthusiasts, as it was the date of the final run of the class on British Rail, although little did we know then that less than four years later a preserved Class 50 would return the mainline! The Pathfinder Tours '50 Terminator' railtour ran from Waterloo to Exeter via the old Southern Railway route, and then after reversal at Exeter St. Davids carried on to Penzance via the former Great Western mainline, thus covering both routes that were home to the class in their latter years. The tour then returned via the Great Western to Paddington. Luckily the day turned out to be perfectly sunny, and here 50050 Fearless & 50007 Sir Edward Elgar are pictured rounding the curve at Oborne (near Sherborne), at this point running as 1Z40 08:52 Waterloo to Exeter St. Davids.